Belgium Coach Roberto Martinez has let his view about Eden Hazard move to Madrid know. 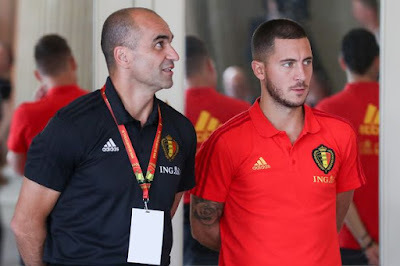 Martinez believes it's time for Eden Hazard to move on and experience a new challenge and also reveal that a move to Madrid is perfect. He made all known during an interview with Spanish outlet Cadena Ser. 'For me, it's very easy to answer that question. He could fit in any team in the world. Players need new challenges and new projects. Chelsea on the other hand, have placed a transfer fee of £200million on Eden Hazard so as to fend off Madrid interest. Martinez also spoke about Hazard's personality and reveal he is surprised by the player ability. 'I've been pleasantly surprised. He has such maturity and leadership skills. Do you think is time for Eden Hazard to move on?